When Apple announced iOS 7 and OS X Mavericks at their 2013 Worldwide Developer Conference (WWDC) in San Francisco, they also made another significant announcement that doesn't get the attention is deserves... yet. FaceTime Audio. On the surface, FaceTime Audio is just another way to make a voice call using VoIP (Voice over Internet Protocol). However, if you dig deeper, you start to see the amazing benefits. First, FaceTime Audio uses a data connection, not a traditional cellular connection like a typical cell phone call does (a la, "Can you hear me now?"). This is beneficial because in many cases (especially when traveling Internationally), traditional cell calls can be expensive, and the quality can be poor. Second, because FaceTime is data-based, that means that it can be used in places where traditional cell phone calls wouldn't work. Just the other day, for example, I helped someone who was having issues with their AT&T SIM card not working on their iPhone 5s. In other words, he couldn't make or receive traditional phone calls. We began troubleshooting by text (he still had a good WiFi connection, so iMessage was working), but when I saw it was taking too long, I called him using FaceTime Audio. He was shocked by the notion because he had never used it before. The use of data also means that you can place and accept FaceTime calls on any of your Mac or iOS devices. When someone FaceTime calls me, for example, that call rings on my iPhone 5s, my iPad with Retina as well as my MacBook Pro with Retina. Convenient, yes. Amazing, absolutely! 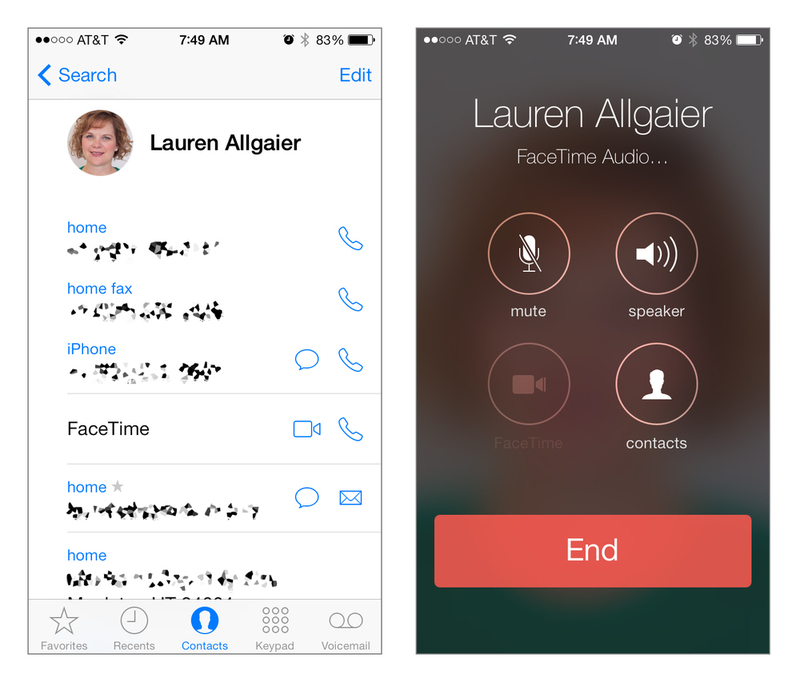 Lastly, FaceTime Audio uses the AAC-ELD audio protocol. Without getting too technical, this is an audio compression standard that achieves a very high quality of audio with little bandwidth. Having a conversation using FaceTime Audio is like driving a Ferrari after driving a VW bus (not that I have anything against a VW bus, but you know...). I try as much as possible to use FaceTime Audio now, and the general response I get from others that I call is, "Wow, why does this phone call sound so clear?!" Yeah, it's that clear. I have made it an effort to use FaceTime Audio whenever possible, even to the point that I have replaced all my dialing favorites with the FaceTime Audio equivalents. It makes one-touch FaceTime Audio calling super-simple. If you haven't used FaceTime Audio yet, you really need to give it a try! If you have no one else to test it with, feel free to give me a FaceTime call (kevin.allgaier @ icloud.com). FaceTime (video) works on all Apple devices with a front-facing camera (including iPhone, iPad and Mac). FaceTime Audio is currently only supported on iOS devices running iOS 7. Posted on October 16, 2013 by Kevin Allgaier and filed under iOS, Opinion, Mac, iPhone, iPad.